I’ve been reviewing films long enough to remember quite how hard publicists worked to play down that perceived mass audience turn-off in the lead-up to its release, a period of such furious re-tweaking of the film that even its title, originally Dancer, was changed to save confusion by a not-to-be-trusted public with the Bjork-starring Dancer In The Dark, also just about to be released. Sounds more than a little ironic now, huh? 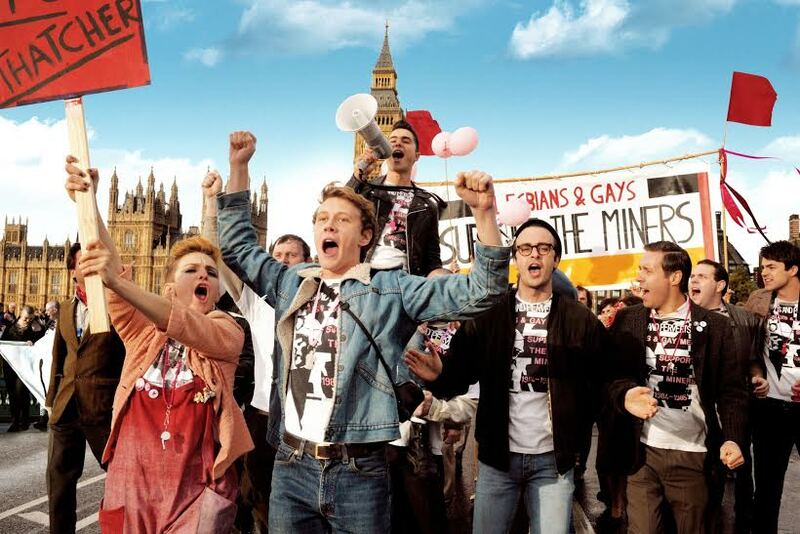 In the wake of the world-wide success of Billy Elliot and its assorted spin-offs, though, Pride makes no bones of the fact that it’s not only set in the midst of the miners’ strike, but also that it actually hinges on the true story of the involvement of lesbian and gay activists in supporting a mining village throughout the strike. I suppose that’s progress in all sorts of different ways. But, just as importantly, Pride is also one of those rare British films that, like Billy Elliot, Brassed Off and The Full Monty before it, manages to take a serious subject and successfully make it into that dreaded term, ‘a feel-good movie’ that stands a very good chance of genuinely striking a chord with that sizeable chunk of the public who simply wouldn’t go to Manchester’s Cornerhouse or the like, let alone stand on a picket line or buy a Billy Bragg record (sorry, Billy, but you know what I mean…). Yep, an honest-to-goodness home-grown hit that isn’t afraid to simply wear its heart, not necessarily its art, on its sleeve. Funnily enough, like Billy Elliot, Pride is also directed by a man who is rather better known as a theatre director. Matthew Warchus not only directed Ghost – The Musical, which had its world premiere in Manchester, while his rip-snorting take on Matilda is still playing to packed houses on the West End and on Broadway, but he’s also just been named as Kevin Spacey’s successor at the Old Vic. A coincidence, I’m sure, but an intriguing one. In the summer of 1984, Margaret Thatcher was in power and the nation was divided, not only over the NUM’s strike but also on many things we now take for granted, such as gay rights. 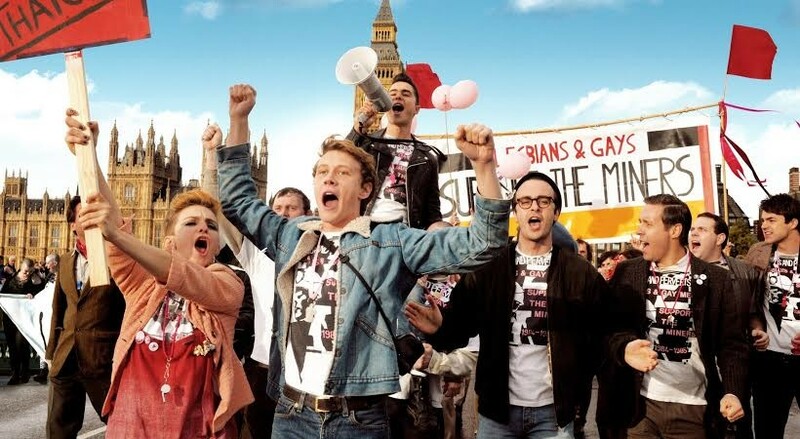 At the Gay Pride March in London, gay political activist Mark (Ben Schnetzer) convinces the usual divergent crew, including a shy, closeted suburban kid Joe (George MacKay), flamboyant actor Jonathan (Dominic West), brash lesbian Steph (Faye Marsay), pretty boy Jeff (Freddie Fox) and bookshop owner Gethin (Andrew Scott), that they should support the miners. So they set up LGSM—Lesbians & Gays Support The Miners—to raise money for the starving workers. Their money-raising efforts are pretty successful but the problem is that the union refuses to accept their help. So they’re forced to directly approach a mining community in a small Welsh town, eventually finding the surprised but surprisingly tolerant Dai (Paddy Considine) to liaise on their behalf. Dai admits that he can’t promise that the rest of his community will be as open-minded, and when the campaigners come to visit they’re initially greeted with suspicion at best, and prejudice at worst. Soon, though, many of Dai’s colleagues (who include Bill Nighy, Imelda Staunton and Jess Gunning) are won over, and hilarity and outrageously camp dance sequences ensue. So far, so predictable – and amiable enough. But what elevates Pride are the engaging performances and the precision and easy wit of the script by Stephen Beresford, whose debut stage play The Last of the Haussmans with Julie Walters was something of a critical and commercial hit at the National Theatre in 2012. Of course, we’ve become used to Bill Nighy looking benign but bemused and Imelda Staunton being lovably larger than life, but even those of us who recently saw him in My Fair Lady at the Sheffield Crucible could be taken aback to see Dominic West cutting a rug so confidently. Sherlock star Andrew Scott and the ever-reliable Considine also impress. But perhaps the film’s biggest surprise is how terrifically well the younger, less well-known actors in the ensemble fare. I’d be surprised if we don’t see a lot more soon from MacKay, Schnezter and Marsay, as well as Jess Gunning, a familiar figure from the comedy circuit who finely judges her turn as the mousey housewife who goes on to greater things. Of course, it’s self-consciously tear-jerking here and there but there’s a core of honesty that prevents it tipping over into saccharine sentimentality. All in all, a very pleasant surprise and a great deal more rewarding than the easy ‘Billy Elliot with gays’ jibes would suggest. Pride opens on September 12, 2014. But you can see it at the Ilkley Film Festival on September 7, 2014. For more details, read Northern Soul’s article here and click here for ticket info.